The Sand Cat is often referred to as the ‘Sand Dune Cat’. This small wild cat likes it hot - in fact Sand Cats feel most at home in the Sahara region of North Africa and the deserts of South-West Asia. The Sand Cat is not the only feline denizen of the deserts - there is also the appropriately-named 'desert cat'. The 'desert cat' is Felis silvestris lyica, also known as the African wildcat. Like the African Wildcat, Sand Cats are perfectly adapted to their environment. Their banded pale-yellow or grey-brown coats provide excellent camouflage which allows them to blend into the sand of the desert background. The Sand Cat has dense hair on the soles of the feet. This unusual adaptation protects delicate pads from the ever-changing extremes of daily temperatures in the sand, which can go from literally baking hot to freezing cold in the course of twenty-four hours. The hairy feet also act on sand as snowshoes do on snow, so Sand Cats move effortlessly - and as a further benefit the spread distribution of weight means that hardly a track is left behind. As desert creatures, Sand Cats have to cope with temperatures of over fifty degrees Centigrade in the day. They do this by digging burrows where they shelter from the heat, and do their hunting at night in temperatures approaching five degrees below freezing. Sand cats have exceptional hearing. The auditory bullae (a hollow bony structure that encloses parts of the middle and inner ear) are unusually large. This gives the cat an enhanced sense which allows it to pick up the movement of its prey across the sand, even when a human would hear nothing but the desolate silence of a desert night. Sand cats mainly hunt rodents and hares and birds when they can find them. The cats have a reputation as snake hunters - particularly the venomous and lethal Horned Vipers and Sand Vipers. To overcome its deadly prey, the cats try to stun and disorientate the vipers with rapid blows to the head before a bite through the neck finishes the struggle. Sand Cats can survive without water even longer than a camel, because they get all the moisture they need from their food. However, they’ll happily drink if water is available, but generally avoid watering holes and the danger from larger predators and birds of prey. Sand Cats are not territorial and will go up to 10km (6.3 miles) while hunting. If a Sand Cat's journey brings her near a human settlement, the occasional chicken might be surreptitiously added to the menu. The Toubou nomads living north-west of Lake Chad report that Sand Cats have little fear of humans and often come to their camp in the evenings and help themselves to the chickens. Fortunately for the cats, the natives treat them with respect, as cats were companions to the Prophet Mohammed and his daughter. (In fact hunting Sand Cats is banned in many North African countries.) So thanks to their domestic ancestors modern Sand Cats frequently get away with their thieving habits. Sand Cats are not unlike small domestic cats in size. An adult’s body is approximately 42-57 cm (16.5 - 22.4 inches) long and the weight is generally 2-3 kg (4.5 - 6.5lbs). The cat’s head is broad with large ears set so low on the skull that they can be turned down horizontally to help in hunting. The greenish-yellow eyes are also large and the eyelids have distinctive, very black, mucosa. The cats are quite stocky and have long tails but relatively short legs. They are not good climbers or jumpers but are very skilled at digging and borrowing. Like most cats, Sand Cats are solitary animals, and seek company only during the mating season in April to May. One to five kittens are born to a litter after 59 to 66 days of gestation. Kittens develop much as do those of domestic cats. They are fully grown and independent after the first year and reach sexual maturity at 9-14 months. No-one has yet determined how long Sand Cats live in the wild, but in captivity their life expectancy is about 13 years. Though most wild animals live longer in zoos, the Sand Cat may be an exception simply because it is so adapted to its desert habitat. Not only might an animal accustomed to roam with almost limitless horizons feel stressed in the cramped confines of a zoo, but air much damper than usual causes the chronic respiratory problems which are the major recorded cause of death for the species. Sand Cats belong to the family Felidae, of the genus 'Felis'. The species name is Felis Margarite. The first description of the Sand Cat came from Victor Loche in 1858 who named the cat after Jean Auguste Margueritte, the leader of the expedition inthe course of which the cats were discovered. There are four subspecies: F.m. margarita, F.m Harrisoni, F.m thinobia and F.m. scheffeli. 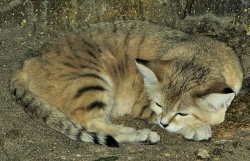 F.m Scheffeli is the Pakistan sand cat. This subspecies was first discovered in 1966. It is at present the only Sand Cat listed as endangered and indeed may well now be extinct in its original habitat. Sand Cats are also now extinct in their former range in Israel.